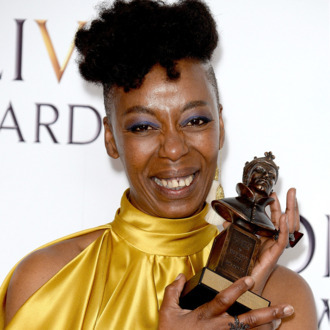 Noma Dumezweni takes home the Best Supporting Actress Olivier. Maybe the cast should keep their statuettes together in one place, just in case they have to be suddenly destroyed to protect the world. The West End production of Harry Potter and the Cursed Child won nine Olivier awards tonight, beating the record held by previous prize winners Matilda and The Curious Incident of the Dog in the Night Time by two awards. The sequel to J.K. Rowling’s seven-part Potter series, written by Jack Thorne and based on a story by Rowling, Thorne and the play’s director, John Tiffany, took home the prize for Best Lighting Design, Best Sound Design, Best Costume Design, Best Set Design, Best New Play, and Best Director. Noma Dumezweni won the award for Best Actress in a Supporting Role for her portrayal of Hermione Granger, while Anthony Boyle received Best Actor in a Supporting Role for his turn as Scorpius Malfoy. For his depiction of the adult Harry Potter, Jamie Parker was named Best Actor. Hopefully next year Cursed Child can magically transform those Olivier awards into Tonys, or, barring that, use them to wail on any and all Death Eaters as needed.